It was very hard to get out of bed this morning (actually, I'm still in bed : P). Once again the day overcast and grey, it's beginning to feel like the UK here in Japan (oh, it's raining now). 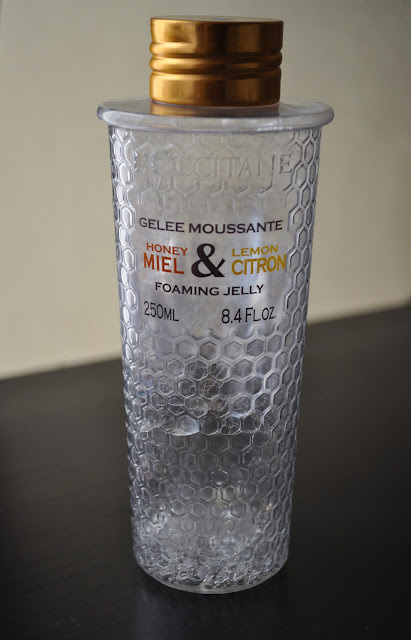 Yesterday, I finished my last bottle of L'occitane's Lemon and Honey foaming jelly shower gel (sadness). I thought I still had another bottle but to my dismay, I was wrong :'( . This was one of my favorite fall scents and I can't believe it was discontinued. L'occitane's Lemon and Honey line was amazing. This line was the best union of the honey and lemon scent EVER! The fragrance of honey is soft , whereas the lemon is a mixture of both sweet and tart.There are also notes of vanilla, patchouli (I'm actually not a fan of patchouli but it's presence here is very soft and clean), and a warm musky woods. A great scent for fall. I want to smell this so badly! I went online and found a L'occitane outlet store in New York. There may be more outlet stores but this was the only one that I found online.